In the coming weeks, the Soldiers of the 50th Infantry Brigade Combat Team will return from their historic one-year deployment from Iraq. The brigade’s return will mark the largest deployment of Citizen-Soldiers since World War II. On the day of their long awaited return, our warriors will reunite with friends and family and begin the transition back into their civilian lives. 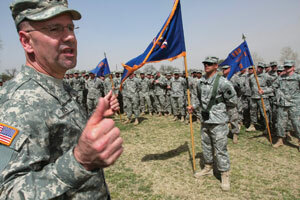 Maj. Gen. Glenn K. Rieth addresses the Soldiers of the 1-150th Assault Helicopter Battalion after the conclusion of their Departure Ceremony at Fort Sill, Okla., on April 9. Photo by Tech. Sgt. Mark Olsen, 177FW/PA. parade and ceremony. This monumental event is proportionate to the historic significance of their deployment and return. The parade will begin at the World War II Memorial, located in front of the Statehouse, and will end at the Sovereign Bank Arena where families await their hero’s entrance. Once the arena doors open for the families, they will be entertained and greeted by first-class performers and special guests. This will be a memorable day and a proper way to close the chapter for this monumental deployment. When our Army and Air Servicemembers deploy, lives are placed on hold for the deployment cycle. Afterward, the transition back to civilian life can be challenging. We have been fortunate to receive assistance from various veteran and private organizations, government departments and agencies, senators, congressmen and other elected officials as we move forward, so that Servicemembers and the public understand our efforts and available resources to facilitate this transition. I understand that deployments are not only difficult for Servicemembers, but, their families as well. However, the families face these challenges with as much sense of duty and courage as the deployed troops. In my eyes, the families deserve equal credit for their dedication and support. In the latter part of 2008, the Secretary of Defense established a national combat veteran reintegration program, affectionately known as the Yellow Ribbon program. The program was established to provide support and outreach to Soldiers and their families throughout the deployment cycle. Most importantly, reintegration activities will occur at 30/60/90-day intervals during post-deployment. Our organization and the Family Programs Office have established a robust program and are diligently working to ensure every returning Servicemember and family member receives the proper care and attention they deserve. Care for our Servicemembers and families has been and continues to be my number one priority. The team is fully committed and well-positioned to provide the services to address any need. The New Jersey National Guard and its leaders have a solemn responsibility to all our Soldiers and families, today and in the future, to secure the benefits and services they deserve. I look forward to the 50th Infantry Brigade Combat Team’s return and Welcome Home Parade/Ceremony on the 12th of June. I encourage all to attend the parade and show your support for our hometown heroes and brave families.